If you're looking to change-up your outdoor seating area, a screened in porch might be the perfect solution. Once completed, the protected outdoor space will bring years of relaxation and enjoyment. A partial enclosure, like screening in an existing porch, costs anywhere from $5,000 to $10,000. Large porches or projects that need a roof will be more expensive. The first step is to check local building codes to see if any permits are needed. While screening in an existing porch may not seem like a major construction project, it's better to be safe than sorry. Ask local government officials about building codes and requirements. Even if there are none, the visit may result in design ideas or information about the best materials. The best part of this project is the existing floor. The floor serves as a great foundation for planning the frame. Start by measuring each side of the floor, then divide that number by the number of screen sections you'd like to have. If you are screening in a porch that has an existing roof, measure the height of your frames carefully and check the roof for any needed repairs. For porches without a roof, construct a triangular framework for over your porch frames and cover it with appropriate roofing material. Tip: Pitch and load capacity are important when constructing a roof, so when in doubt, consult a professional. Aim for screen frames of 2.5 to 3 inches. Use pressure treated 2x4s to construct simple wooden frames that extend between the existing floor and the roof. You'll want to leave a 32- or 36-inch opening for the screen door. Wood screws work better than nails for securing a strong structure to an existing roof. Attach a foundation board to concrete with concrete screws for permanent placement. Attach the frame to the foundation board. The next step is to paint or stain the frame before installing the porch screens. Painting the frames is a terrific opportunity to add color to the exterior of your home. For a more natural look, stain the frames instead. Cover the porch floor to protect it from the paint. After the paint or stay dries, it's time to install the screens. There are options when it comes to the types of screens available for porches: standard and removable. Standard - Cutting sheets of porch screening with scissors or a utility knife and using a staple gun to attach them to the frames is the standard screen installation. Pulling the screen tightly between the frames is very important before stapling it into place. Cut away any excess and cover staples with veneer or trim. Tip: Screen base strips with spline indents around the frame makes for a better fit, a taut screen, and makes changing the screen easier in the event of a tear. Removable screens - While the purpose of a screened in porch is to keep insects out, there may be times when a nice summer breeze has you desiring a more open porch. A hook and loop fastening system uses hooks on the frames and loops on the screen. Simply roll up the screen or completely remove it. The removable screens are durable while in place, yet are versatile in use. Tip: The screen door is the gateway to and from the porch. Subject to a lot of movement over time, a standard screen for the door is usually the safest bet for the door. Flooring: rugs or outdoor carpets add flair and ambiance to a screened in porch. They also add color, along with porch furniture and plants. 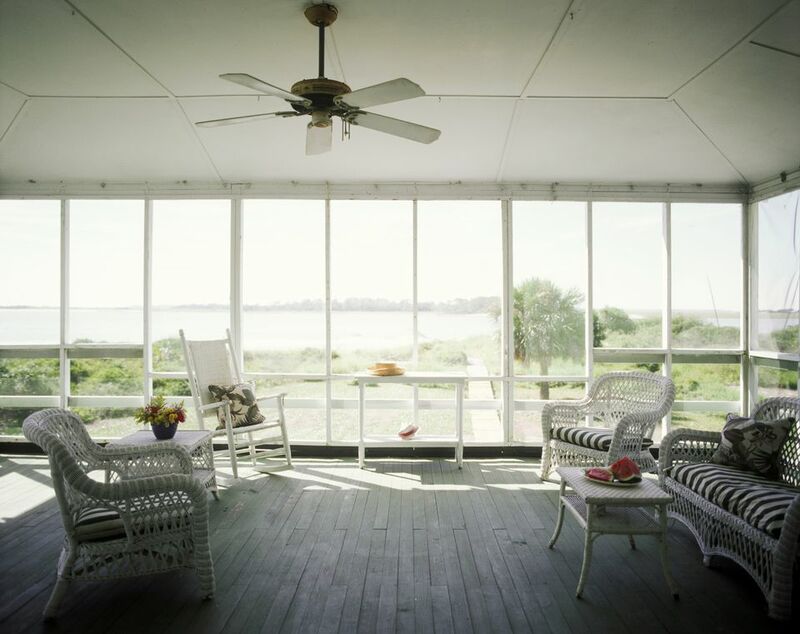 Electrical: The lazy spin of a ceiling fan is a great addition to a screened in porch. Hire an electrician for proper installation. A screened in porch is still exposed to the elements, so regular maintenance is a must. HomeAdvisor's survey reports that porch repair costs average as much as $2,000 for outdoor rooms/spaces. Replace screens with tears, keep tree branches away from the roof, and look for any changes in the frames. Save money by regularly inspecting your porch instead of facing expensive repairs later. Enclosing a porch is easier with a little help from your friends. Turn the project into a porch party day, complete with snacks and music. Not only will you and your friends enjoy time together, you'll create a space where you can gather in the spring, summer, and fall. Patio or Porch: What's the Difference? What is Rattan and Rattan Furniture? What is an Awning Used for? What's the Difference Between a Baluster and a Balustrade? What is a Courtyard or Atrium? Which Type and Shape of Patio is Best for Your Yard? Do You Live in a Mediterranean Climate?